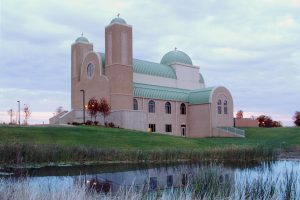 Zimmerman was hired to design the only Coptic Orthodox Church in Wisconsin. The church will seat 400 people, with classrooms and a large multi-purpose room in the lower level. The form of the building symbolizes an arch, a long tradition for the Coptic faith, who see the church as a protective vessel. The interior design of the church, has three barrel vaults running the length of the sanctuary, and a domed cupola above the altar. The large main dome – a symbol of heaven – and two smaller tower domes – symbols of lookouts aboard a ship watching for worldly dangers perch more than 50 feet above the structure’s floor. The iconostasis wall was fabricated in Egypt, and coordinated by Zimmerman. The 5 acre site is located on Drexel Avenue and I-94.